So, the War Doctor, Doctor no more, Granddad or whatever you want to call him is back for three more tales set during the Time War. 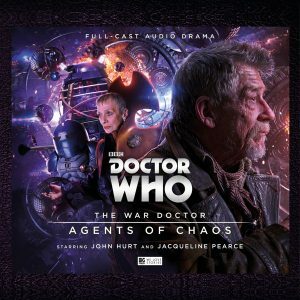 Played by one of the most revered actors in the world, Sir John Hurt, I always look forward to a new War Doctor box set and in Agents of Chaos things really heat up, as Earth is almost drawn into the war, the Sontarans stick their stubby noses in and the Eye of Harmony itself comes under threat leading to potentially catastrophic results for Gallifrey. It’s a marvellous thing that over the last couple of years, and courtesy of Big Finish, the Time War has become a reality instead of remaining a thing of legend. Spoken of in hushed tones, it was always a taboo subject that those who survived it, The Doctor, The Master and even the Daleks, were reluctant to talk about. Now however, we get to experience all the adventure, horror and woe of the biggest war in the history of the Universe. The opening tale, The Shadow Vortex sees the Doctor teaming up with a secret police officer from East Germany during 1961 at the height of the Cold War. Together they set out to track down a Dalek Agent who is attempting to break the time lock and drag an unsuspecting Earth into the temporal conflict. The Shadow Vortex is an intriguing start to this new saga of the Time War and one wonders what it may have been like if Earth had become involved. Speaking of getting involved, the next segment, The Eternity Cage, is one all the fans have been waiting for! We’ve had Daleks versus Cybermen in Doomsday (which I still think was a very one sided affair), but here in The Eternity Cage it’s The Pepper Pots against the Potato Heads. Yes, that’s right, the Sontarans are trying their very best to become part of the Time War, much to the chagrin of both the Time Lords and the Daleks. Led by General Fesk, played by the ever reliable Dan Starkey of Strax fame, the squat soldiers have come up with an ingenious plan, involving the kidnapping of Cardinal Ollistra, that they are convinced will allow them to participate in the greatest war the Universe has ever known . The last part of Agents of Chaos finds the Doctor and Ollistra trapped on board a critically damaged battle TARDIS. Eye of Harmony is a strong, solid story that brings this latest chapter in the War Doctor series to perfect conclusion, as the very source of the Time Lords power comes under threat and the Doctor and his allies have to deal with a traitor in their midst.